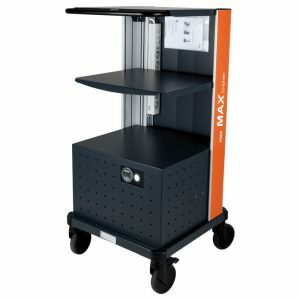 The MAX Mobile Workstation is ideally suited to flexible data collection and independent work in the warehouse environment including logistics, goods in / cross docking, shipping and inventory control. Independently of the mains supply, the user can e. g. register incoming goods in the IT system directly at the point of delivery. 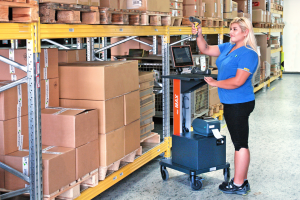 The advantages include minimised work pathway, the ability to store goods faster and fewer stationary workplaces. 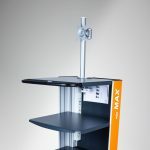 The extremely robust design and flexible modular system with a wide range of options ensure a process-optimised work station that is tailored to your specific requirements. 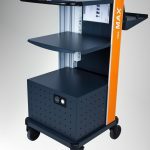 The standard (STD) version of the MAX mobile workstation features two maintenance-free 12 V/65 Ah gel batteries and 230 V/300 VA voltage transformer. 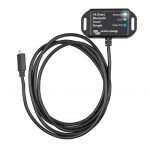 This enables the operation of portable devices such as PCs, terminals, screens, scanners and label or laser printers. 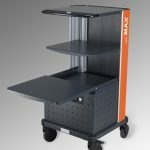 To achieve higher performance, the mobile workstation MAX is available with 700 VA or 1.500 VA. Furthermore versions with lithium-ion phosphate battery are available. 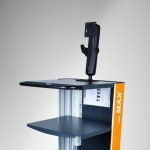 A short animation shows how mobile workstation MAX reduces travel time and makes IT equipment mobile. On request, ACD also designs and manufactures mobile workstations and order picking trolleys based upon your individual requirements, for example: Service trolley, mobile inspection station, Maintenance trolley, Remote maintenance system, Special brackets. 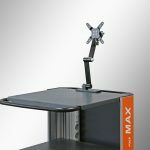 Prior try our Mobile Workstation MAX out! 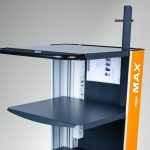 Deposit panel with grip – extractable. Box for cups, pencils, scanner, etc. Aluminum monitor support with 2 hinges. Suitable for LCD/TFT monitors with maximum 25 kg. The lateral storage box consists of a robust plastic box and a mounting device. 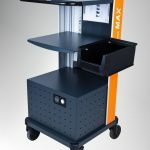 The storage box is mounted laterally at the frame of the mobile workstation. Mounted on tabletop with bore holes for VESA holder. 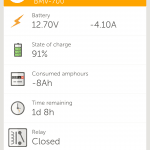 App to display data and alarms. Suitable for Apple and Android smartphones, tablets and other devices. You can download this app free of charge in the App Store.